αVII Series to wrap the bread-sum confectionery, frozen desserts | Horizontal Pillow Packaging Machines | FUJI MACHINERY CO.,LTD. A reverse pillow packaging machine with an AC servo drive. 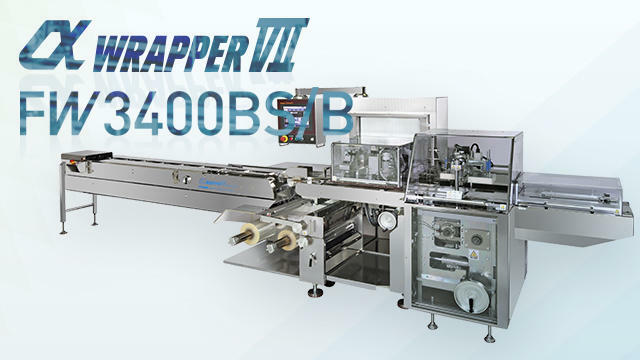 Suited for packaging loose items, noodles, etc., and for secondary packaging machines such as accumulation devices. Rotation seal or box motion seal types (/B) can be selected for the end seal parts. Lineup models include the standard specification 3400 type, the wide specification 3410 type, and the stainless steel wide specification 3710 type. The Attachless Dispenser System, which employs a belt conveyor control system in the dispenser conveyor part, is also available.